Enjoys Is natty from ridge Kalikuning gives unforgettable experience. More than anything else, if it is added service of main resort class and facility. Differed from other resort of which more able to be enjoyed if only with family or people closest, Kalyana Resort gives concept to differ in. This is resort giving opportunity for group in number limited to enjoy togetherness. 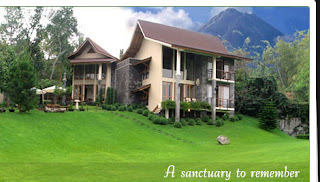 This resort merupkan modern building blend of minimalis, green mountainside map, and modern facility. Four fruit of villa stands up among green trees with swimming pool haves water limpid, verandah of ancient palace place of eating with terrace;core above creavasse, and amphitheater in vinicity. Do not too near, but also non enough far from Merapi. Kalyana Resort stands up above land (of) with a width of 10000 square meters. Three fruit of villa is built with modern concept, each with 2 room;chamber, 3 room;chamber, and 4 room;chamber. Another, this building has 14 room;chambers. This acurate resort applied for meeting company, nuptials party, activity retret, outbound, family reunion, and other activity with number of quite a lot participants. Because the different concept, Kalyana is not many providing addition facility exploiting natural resources. But, for activity a kind of meeting or nuptials party, Kalyana have separate excess. Here available meeting room which representatif. Visual audio of room also available, for small meeting and can be functioned as mini cinema for entertainment amusement in between meeting. Library with a number of collections and internet network is addition facility which able to be obtained. Kalyana location do not off street Kaliurang Km 22. Its(the access is hardly easy to because residing in line wisata towards Kaliurang. Its(the location which 3 kilometre only in wisata area south, makes Kalyana presents rural typical situation of hillside. Acurate in its(the east side, creavasse Kalikuning which in carpeting. Blue natty Temporary seems to clearly seen enjoyed from gazebo. Wide yard with thick grass carpets in resort east side adds kenyamaan. Swimming pool stays middle of area, makes we can enjoy its(the green edge forest times bathing. Besides, warmness coffee will felt is scrumptious is drinked with semilir mount wind and food typical of Kaliurang: jadah tempe.